Wendy’s is probably my favourite fast food burger joint (it’s neck-and-neck with A&W). But of course, being the best fast food burger chain isn’t exactly a tall mountain to climb. 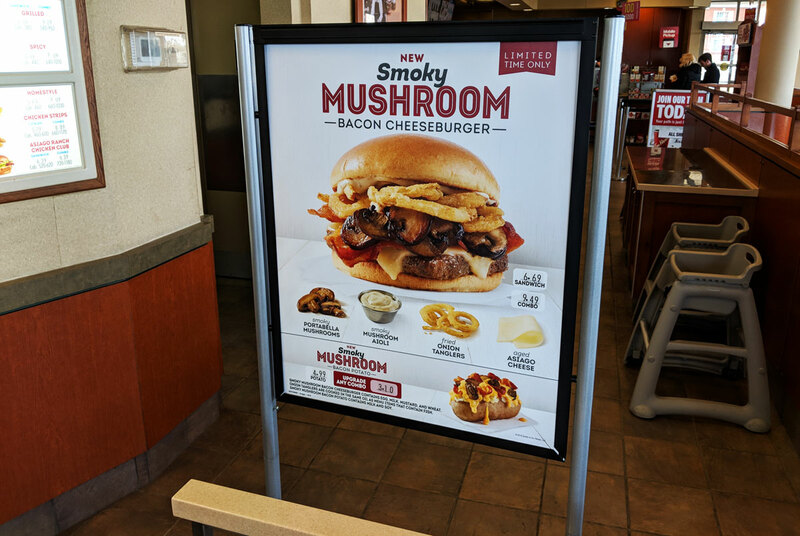 That’s why I was so shocked at how much I enjoyed the Smoky Mushroom Bacon Cheeseburger at Wendy’s. 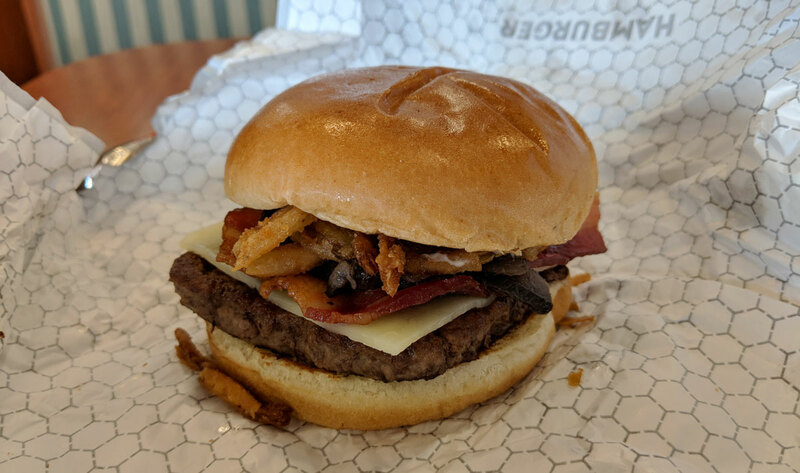 It’s topped with mushrooms, bacon, aioli, fried onion tanglers, and Asiago cheese. 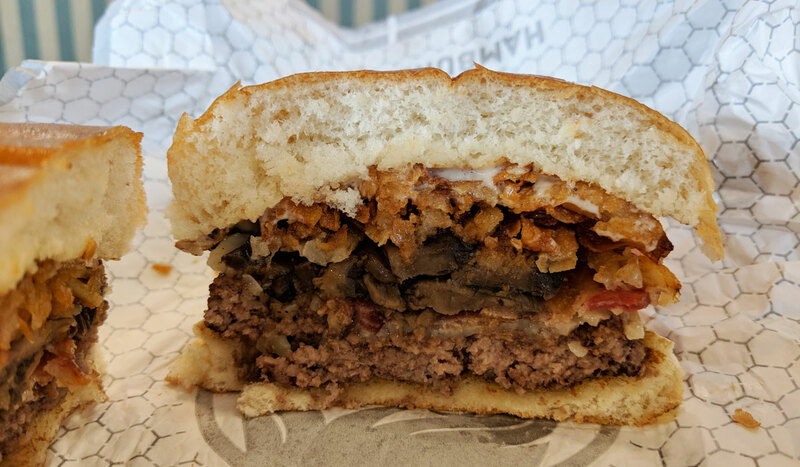 It’s easily the best fast food hamburger I’ve had in a long, long time. It’s still a fast food burger, so the patty itself wasn’t particularly great — but it wasn’t too dry and it didn’t have any off flavours. For a big fast food chain, that’s about as good as it gets. Burgers from a place like this tend to be more about the toppings than the burger itself, and that’s where this one really stood out. The Gouda was pleasantly sharp and creamy, the aioli was tasty, and the bacon was substantial enough to not get lost among the other flavours. I’m normally not a huge fan of mushrooms on a burger, but these were well cooked and suited the burger well. But what really put this over the top were the fried onion tanglers. I assumed these were going to be the typical crispy fried onions that come out of a bag, but they were actually little onion rings that had clearly been freshly made. They were great. At first I was thinking that the price was a bit much — it’s about $7.50 with tax for the burger alone — but then I ate it, and yeah. It’s worth the money. It was good. Not just good for fast food, but good, period. I should note that the Wendy’s I went to was staffed entirely by adults who seemed to know what they were doing. It was obvious that all of the components were relatively fresh, and it was assembled with care. But it could have just as easily been thrown together by a bored teenager, so as is always the case with fast food, your mileage may vary.